Thank you very much, they look lovely just what I pictured. Thanks again. Send a Balloon - A Box of Fun Delivered! Floating Helium Balloons are filled with helium gas - we package them in a beautifully decorated balloon box with ribbons and a fresh flower decoration. Imagine their surprise when they open the lid... Smile .. Out pops a helium balloon - The Perfect Surprise! We have a huge range of balloons to choose from, ready for all occasions. Perfect gift for Hospitals! See the pictures below to order your Balloons Direct: You can order online and tell us what occasion your balloon is for and we will match your balloon. Or Call us on 09 838 9058 to discuss balloon options. Helium Balloons - Free Delivery. Get Well Soon Balloons, Kids Balloons, Birthday Balloons, Anniversary Balloons, I Love You Balloons, Baby Balloons, It's a Boy balloon, It's a Girl ballons, Thank you balloons, I miss you balloon, You're special balloons, Happy Anniversary balloons, 25th Anniversary balloons, 50th wedding anniversary balloon, Congratulations, Thinking of you balloons, engagement baloons, Happy Retirement balloons, Smiley Face balloons. 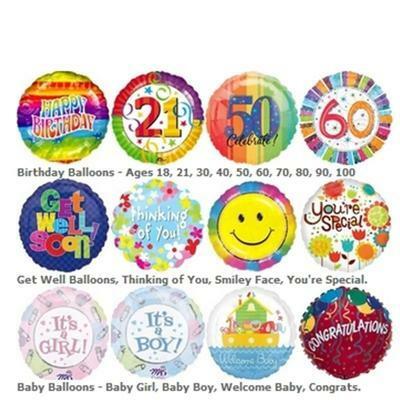 We also carry the full range of Age Birthday balloons - 1st, 18th, 21st, 30th, 40th, 50th, 60th, 70th, 80th, 90th, 100th birthday balloons. Choose from chocolates, teddy bears, flowering plants or even a Balloon bouquet. Yes we also stock air balloons too. Send a Balloon in Auckland - The Fun Gift!